With attractive and long lasting flowers, Damperia are not that difficult to grow in the garden as long as you have a sunny position and a well drained soil. They will grow in light shade, however they do tend to get ‘leggy’ and do not flower as well as they do in full sun. They also do not like humidity, so tropical climates do not suit. They are a wide spread genus. 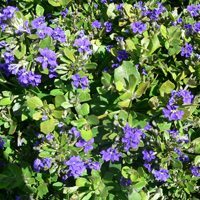 Dampiera are found across Australia, from Western Australia (Dampiera diversifolia and others) to Queensland, so with that sort of spread they are a diverse lot. With over 50 species in the genus, variety occurs in foliage form, size and flower colour. The flower colour will vary form blue to purple and pale mauve. ‘Mallee mauve’, Dampiera ‘Mallee Skies’ and Dampiera ‘Blue Moon’ are three popular cultivars, all reaching about 50 cm and spreading over 1m or so. Dampiera linearis is a popular low growing species. Damperia diversifolia is a very low growing matt forming species. Damperia stricta ‘Glasshouse Glory’ is from the cooler areas of Queensland and is also popular. Generally they require a well drained humus rich soil and a sunny position. They do grow well in containers and will sucker to spread and form a clump over time.